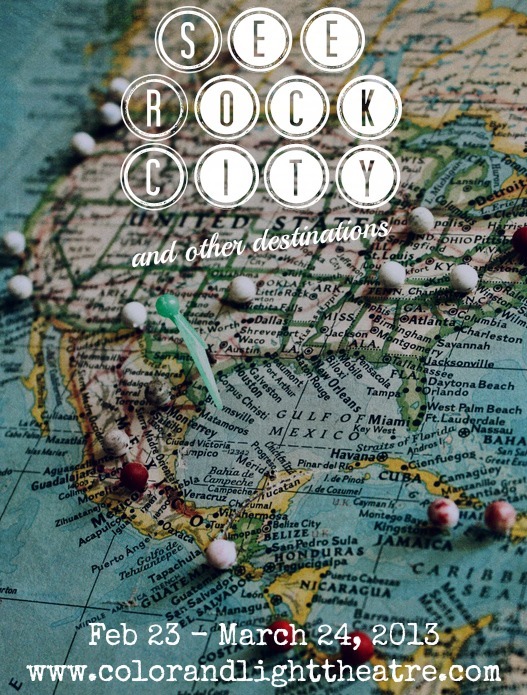 SEE ROCK CITY & OTHER DESTINATIONS is a contemporary musical about connections missed and made at tourist destinations across America. A wanderer believes his destiny is written on rooftops along the North Carolina Interstate. A young man yearns to connect with intelligent life. A woman steps out of the shadow of her grandparents’ romance to take a chance on love. Three estranged sisters cruise to Glacier Bay. Two high school boys face unexpected fears on Coney Island. A terrified bride-to-be ponders taking the leap. With a score that incorporates pop, rock, folk and more, each story builds on the last to create a vivid travelogue of Americans learning to overcome their fears and expectations in order to connect. Winner of the 2008 Richard Rodgers Award and the 2007 Jerry Bock Award, See Rock City & Other Destinations was produced off-Broadway by Transport Group at the Duke Theatre on 42nd Street in 2010. Winner of the Drama Desk for Outstanding Book and also nominated for Outstanding Music, Outstanding Lyrics, Outstanding Lighting, Outstanding Direction and Outstanding Musical.